Rocky Mountain Clean Air Action is the only group dedicated to protecting clean air for healthy children and healthy communities in Colorado and the surrounding region. We are fiscally sponsored by a 501(c)(3) nonprofit, all donations are tax deductible. Online at www.ourcleanair.org. Eliot Spitzer's successor, New York Attorney General Andrew Cuomo, has subpoenaed five energy companies, including Xcel Energy, because of their plans to build coal burning power plants without disclosing financial risks to investors. The subpoenas are seeking documents from Xcel Energy, AES Corporation, Dominion, Dynergy, and Peabody Energy to determine whether companies disclosed to investors the risks of increasing carbon dioxide pollution. Carbon dioxide is sure to come under regulation by federal and state governments, adding a major expense to the cost of burning coal. Xcel Energy, which operates throughout Colorado, has been a frontrunner as far as investing in renewable energy sources, but still has quite a bit of coal baggage to deal with. Not only is the company in the process of constructing a large coal burning power plant near Pueblo, it still operates seven coal burning power plants in the state that collectively release more carbon dioxide than any other source in Colorado. Described as "rare, if not unique" for securities laws to be used towards environmental ends, the New York AG's office has never been shy about being innovative. Eliot Spitzer, the current Governor of New York and former AG, cut his teeth by reigning in corruption on Wall Street using the full authority of the state. The news of the subpoenas comes as western Governors, including Colorado Governor Bill Ritter, last week discussed ways to promote more coal burning. It's been said that with the use of "clean coal" technology, we can effectively safeguard our environment, but it's a specious statement at best. Even clean coal produces carbon dioxide and without any means to capture the carbon, it sounds like a global warming boondoggle at best. With our fossil fuel economy falling by the wayside, we need new ways to harness renewables and to increase energy efficiency. With the New York AG taking strong action, we need to move away from fossil fuels, not just call them by a different name. A federal judge in Vermont ruled this week that states can adopt greenhouse gas pollution standards for automobiles. The ruling is a huge step forward. Not only does it give Vermont authority to reduce greenhouse gas pollution from tailpipes, but it makes clear that other states, including California, have the rightful authority to keep check on tailpipe pollution, even when the federal government does not. With the Bush Administration refusing to do much of anything as far as reducing greenhouse gases, the ruling gives states an important tool in the fight to reverse climate change. Coincidentally, Colorado itself is looking at adopting the same tailpipe standards as Vermont and other states have already done. In fact, a detailed presentation is set to be given to the Colorado Air Quality Control Commission on this very issue next Thursday at 1:00. With the latest federal court ruling, it's pretty likely that Colorado is the next state in line to adopt tough clean car standards. We're talking the talk and it's only a matter of time before we walk the walk. The City of Loveland Water and Power Department is apparently pushing for a clean air specialty license plate in Colorado. The proposed plate would say "Clean Air Rocks." The thing is the extra money would do nothing to clean up cars. Instead, it would go toward purchasing renewable energy credits to offset the pollution from cars. We need renewable energy, but it shouldn't come at the expense of clean cars. Not only that, all the renewable energy in the world won't safeguard public health from air pollution spewed by traffic. One study just released found that jogging in traffic cuts blood flow to your heart. We're not heartened by any effort to promote renewable energy that doesn't also promote clean cars. Any extra money from a clean air specialty plate should go directly toward reducing tailpipe pollution, not subsidizing dirty cars. First off, a special committee appointed by Colorado Governor Bill Ritter has issued its ideas for reducing greenhouse gas pollution in Colorado. The ideas have no official backing from the state of Colorado, but may serve to guide future action. At least we hope. There's a lot of talk about reducing greenhouse gas pollution here in Colorado, but not much progress. Progress may take time, but honestly, where is the leadership here? Next, Wyoming Governor Dave Freudenthal put the smackdown on Americans for American Energy, an industry front group headed by Greg Schnacke, the former head of the Colorado Oil and Gas Association. Finally, Representative Diana DeGette is introducing a bill that would protect the Roan Plateau as a Wilderness Area. Talk about a smart move, kudos to Representative DeGette for stepping up on this issue! Some places are just too special to drill away, and the Roan Plateau is certainly one of them. Oil and gas drillers can reduce their air pollution and make money, the subject of a conference yesterday in Glenwood Springs, Colorado. According to industry, readily available technologies can both reduce methane and reduce harmful air pollutants and yield a profit. This win-win situation needs to become standard practice in the Rocky Mountain region. With air pollution from booming oil and gas drilling tied to rising public health concerns, this is an opportunity we can ill-afford to miss. Don't know what we're talking about when we talk about methane and volatile organic compound emissions? 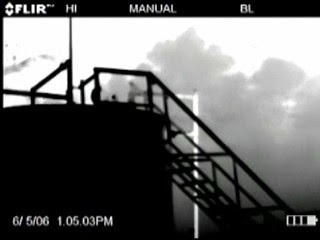 Check out this video (~6 MB), which uses infrared technology to expose volatile organic compound emissions from a condensate tank north of Denver. Rather than letting the pollution vent, drillers can capture these gases and put them in the sales line to make money. What a deal! Local musician Molly Cherington is holding her first, full-length CD release show at Swallow Hill in Denver on September 22nd. As if that wasn't great news, part of the proceeds will benefit Rocky Mountain Clean Air Action! That's not all. The first ten through the door have a chance to join Rocky Mountain Clean Air Action for only $1! $1 for a membership to a cutting-edge, immensely effective, grassroots clean air advocacy group? What a deal! Support local musicians, support Molly, support clean air, support your health, come to a great show! Click here to buy tickets online >> Visit Molly online, http://www.mollycherington.com/. Nitrogen oxides are a group of harmful gases spewed by tailpipes and smokestacks. They form when fossil fuels are burned and pose serious health threats. So serious in fact, that the Clean Air Act requires a limit be set on the amount of nitrogen oxides in our air. This limit is called an ambient air quality standard. By law, ambient air quality standards are supposed to be based solely on what is needed to safeguard our health. And right now, the U.S. Environmental Protection Agency is reviewing the latest science to see if current ambient air quality standards for nitrogen oxides fully safeguard our health. The agency just released a draft science assessment reviewing hundreds of studies. The overarching conclusion of all these studies is that nitrogen oxide standards need to be strengthened considerably. Recent studies provide strong scientific evidence that nitrogen oxides are associated with a range of respiratory effects, even where the range of 24-hour average concentrations are below the current standard of 53 parts per billion. There is a suggestive link between nitrogen oxides and premature death, although additional research is needed to explain the link. The new body of epidemiological data provides strong evidence of associations with increased emergency room visits and hospital admissions for respiratory causes, especially asthma and emphysema, and short-term ambient exposure to nitrogen oxides. There is strong evidence of partially irreversible decreased lung function growth and lung function capacity among children with long-term exposure to nitrogen oxides from traffic. The science assessment found that concentrations as low as 5 parts per billion over a 24-hour period adversely affect our health, especially the health of our children. Yesterday in Denver, the 24-hour average nitrogen oxide concentration was 19 parts per billion. So what does this all mean? It means that we have our work cut out for us. It also means that we have all the more reason to be pushing for a shift from our reliance on fossil fuels toward clean, renewable sources of energy and transportation. Did you know Rocky Mountain Clean Air Action sends out a monthly electronic newsletter to all its members and supporters? We do! And right now, Rocky Mountain Clean Air Action's August electronic newsletter is online. Check it out. If you'd like to subscribe to our e-mail list to receive news and alerts, click here, it will only take one second! Where is the Post's Credibility on the Roan?